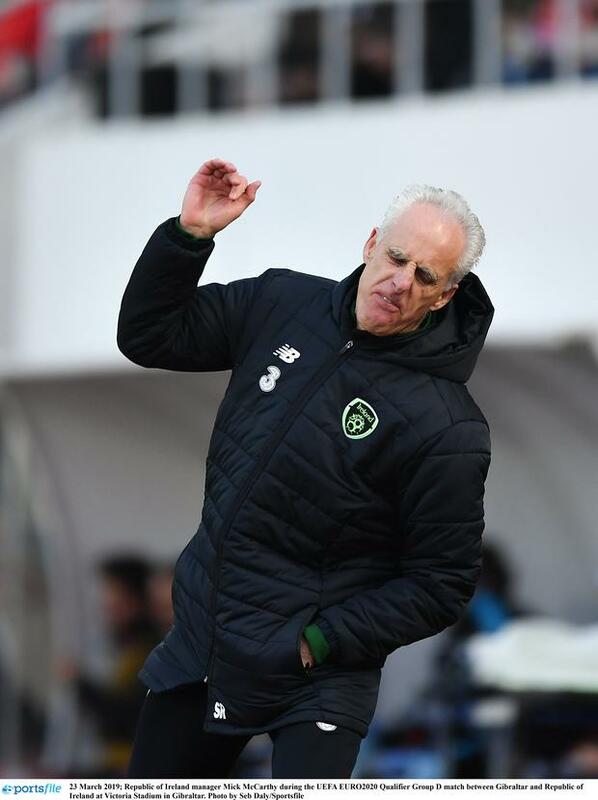 Mick McCarthy admitted that he 'pretty much hated every minute' of Ireland's 1-0 win in Gibraltar that started the Euro 2020 qualification campaign with three points. A nicely taken goal from Jeff Hendrick in the second half was enough to secure the win at Victoria Stadium, but Ireland created little else in a disappointing performance. It was McCarthy's first game in what is his second spell in charge of the Ireland team, and speaking to Tony O'Donoghue on RTÉ afterwards he admitted that it was an underwhelming affair. "I pretty much hated every minute of that," he said. "I knew what it would be like. We were never going to complain about the pitch. The wind was blowing a gale. We didn't play particularly well. We had chance, one or two in the first half. Darren Randolph was probably man of the match. "I was asked earlier on about gaining momentum and I can only gain momentum by winning games. I would have taken 1-0. I wanted to score more and play better but we have three points." McCarthy conceded that the decision to play Matt Dohety at right wing to accommodate both the Wolves star and Seamus Coleman didn't work. "Not particularly, if he is a fullback more often you are coming from behind," McCarthy said of Doherty. "I said he has been the best attackin right wing back in the Premier League. It didn't work today. Maybe there wasn't much room in behind them when they sit in. Does he have the box of tricks to get past people? Probably not. I don't think having changed it and put Robbie on, does he look completely match fit? Would he have lasted 90 minutes? I don't think so." Thoughts quickly move on from Gibraltar to Georgia, who visit the Aviva Stadium on Tuesday. The Georgians lost their opening game 2-0 to Switzerland and McCarthy is hoping for a better performance in Dublin. "I'll be looking at it [the Gibraltar game] tomorrow morning and pick the bones out of it," McCarthy said. "It is going to be a completely different game against a completely different team. Georgia lost tonight and they will be looking to get some momentum against us. They will be watching that and think we are hopeless but we will play better than that. I said I hated every minute of it. They are horrible games and I'm thankful we are out of here with a 1-0 win. Former Ireland captain Richard Dunne admitted Ireland ‘need to improve’, as he tired to find silver linings from a limp display. "A lot of our football lacked intelligence," said Dunne told RTE. "We need to get forward, but we need to show patience and be a little more structured in the way we do it. We need to be more creative in what we are doing. "This is not the moment to hammer Mick or the players. We have to judge it over the course of the qualifying campaign. "There has been negativity around for 18 months and they need time to turn that around."